Roses are quite special to me. I catch their scent in the morning breeze and it makes me blissfully sentimental. As a child I would often tag along behind my Great Uncle Syd as he tended his magnificent roses in England. A long time and passionate cultivator of roses, his gardens were quite special. Syd even created a hybrid that he named after my mother. This rose petal jelly invokes memories of my childhood each time I open a jar. The roses on our property are called Snow Pavement (Schneekoppe). This is a pale lavender Rosa rugosa hybrid from Germany and hardy to zone 3. 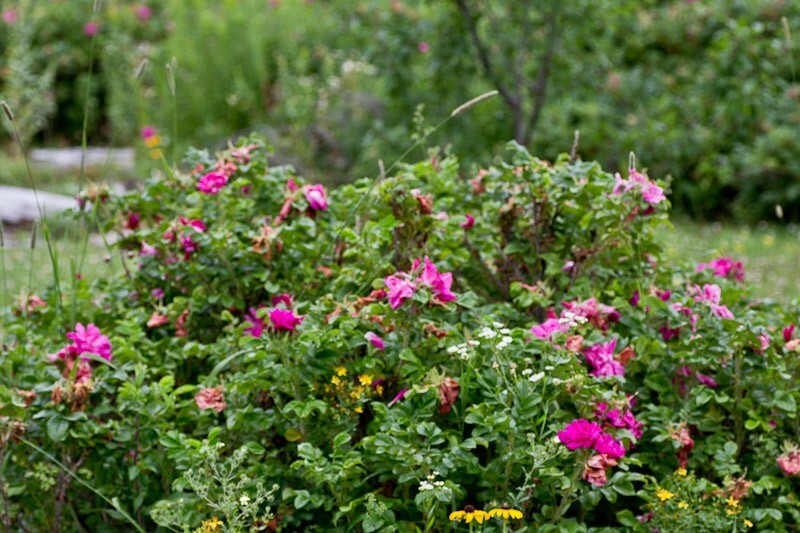 They are very disease resistant roses that bloom from early summer into fall frost. We also have similar roses in fuchsia and white. You can use any type of rose for this recipe but please be careful to only use roses that have not been treated with chemicals. Over the summer I collect the rose petals every few days and place them in a drying rack. You can tell that rose petals are ready for collecting by running your hand gently over the flower. The petals will come free with no resistance when they are ready. Spread them out on a mesh screen to dry and then store them in an airtight container. This recipe works well with both fresh and dried petals. 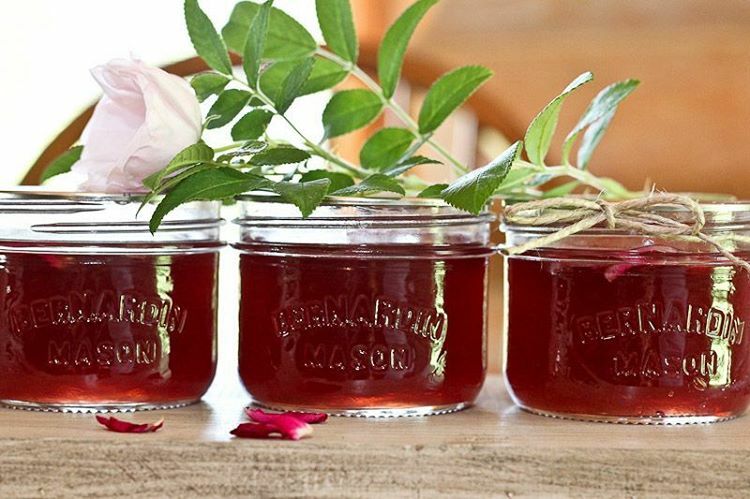 This rose petal jelly is lightly floral with and bright with a hint of lemon. Serve it on fresh buttered bread or drizzle it on top of vanilla ice cream (I like to shave a few slivers of chocolate on top) . We often have fruit & yogurt smoothies and a spoonful of this jam adds a nice flavour. This recipe is inspired by a recipe found in the book “The Jams and Jellies of Christine Ferber, my favourite recipe book of all time. You can read my post How to Make Gourmet Jams & Jellies (that are easy to make) for even more Jam & Jelly inspiration. 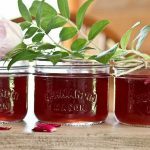 If you like this recipe you might also like Home Canning: Raspberry Jam with Kirsch Recipe or Home Canning: Strawberry Rose Jam. Place the rose petals and water in your jelly pan and bring to a boil. Remove from heat and let steep for 30 minutes to an hour and then strain. Reserve four cups of liquid. Wash your jars with hot water and soap and set aside. Prepare your canner and heat it up. Squeeze one lemon and add the juice of the lemon and four cups of rosewater and the sugar to your jelly pan. Bring to a low simmer. Add two pouches of liquid pectin or about 1 half pint jar of home-made apple pectin or for a reduced sugar recipe use 4tsp calcium water and 4 tsp Pomera's pectin. Keep in mind that with rose water there isn't any natural pectin so you need to use quite a bit to get a good set. Bring to a low boil for five minutes and test the set. When you are happy with the set, ladle the mixture into your jars, wipe the rims, place the warmed lids and the rings on the jars and carefully set them into the canner. For a special finish: Add some rose petals to the bottom of your jars before filling with the jelly mixture. Following your canners instructions process the jars for ten minutes. Turn off the heat and carefully remove the lid. Steam can cause burns so use caution. Let the jars cool for 10 minutes and then using a jar lifter carefully lift them and place them on a cutting board or towel to cool completely. TIP: Testing the set: Place a saucer in your freezer to chill. When you are ready to test the set, drop a spoonful of the jelly onto the saucer and wait about 20 seconds. You can then determine if the jelly once cooled will be set to your desired consistency. You can boil for another five minutes and test the set again.